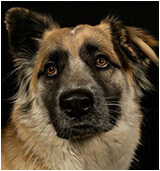 Meet Baloo, this handsome year and a half old rescue spends his days hanging with the crew at Wildwood Guitars. Owner Devyn says Baloo loves his Downtown walks, sniffing the savory scents emanating from the restaurants and greeting all the folks that care to stop and give him some love. It’s a good life. Built in approximately 1908, this house was owned by the Caranci family from 1927 to 1993. Ray and Nadine Caranci owned Louisville Electric on Main St. and Ray is a former Louisville City Councilman. As promised DD subscribers get it first. 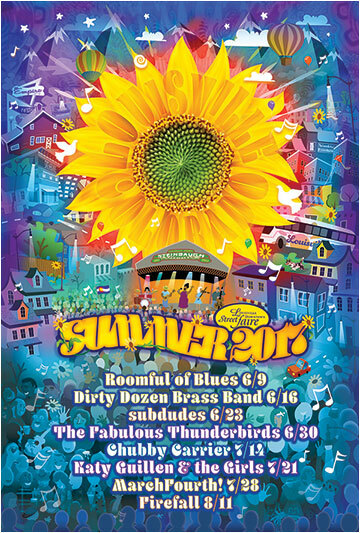 See you this summer! Want to know how you can get in on all the fun of the Faire? Sign up to be a volunteer!! We're looking for Street Faire volunteers to help us sell tokens and serve beverages on Friday nights! Join us for great music and fun memories with family, neighbors and friends.If interested, please email louisvillestreetfaire@gmail.com. You won’t want to miss the annual Spring Art Member show featuring local artists and a host of events. An afternoon tea, on Thursday is perfect for those who want to meet some of the artists and learn their process in a relaxed atmosphere. On Friday there is wine and cheese reception where awards will be presented. 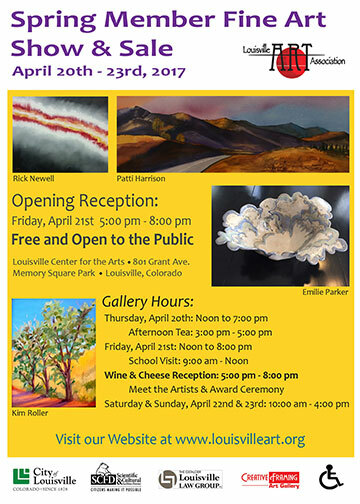 Check the LAA website www.louisvilleart.org for more information. All pieces in the show are for sale so come show our support. Do you suffer from chronically tight hips and hamstrings? Does limited flexibility prevent you from fully exploring certain yoga poses? If so, you are not alone! This two-class series will explore a more mindful approach to improving flexibility in the hamstrings and hips, increasing stability and strength. This is an all-levels class for any individual looking for more freedom of movement and comfort in sports and everyday activities. Cost for the class is $40 for 2 sessions; $30 for single session. Take a walk down to one of the oldest buildings in Louisville, the historic Grain Mill. Louisville Chiropractic will be hosting local artists Jeff Boyd, Chelsea Zaloumis, young local musicians, The Hunter Hamilton Group and Emelise Munoz. Unique foods from regional food trucks will be served. All proceeds go to Colorado Community Enrichment Group (CCEG) and to featured musicians of the night. Suggested donation is $5. Registration is taking place now for a variety of summer workshops and classes like Bring it to Broadway. This week-long theatre camp is hosted by Broadway stars Shannon O’Bryan (Follies, 42nd Street, On the Town) and Nick Dalton (Hair, Legally Blonde, Hairspray). Join them in July to learn scenes, solos, ensembles, and choreography from a large variety of musicals that will challenge and enrich the development of a young artist! The week ends in a final performance for the public. No dance experience necessary, but special classes will be offered for dancers and singers. Hurry! You save when you sign up during Early Bird Pricing! Visit www.danavmusic.com, or call 303-974-5586 for more information on other summer camps and workshops. Read and knit at this fun-filled event! Eric and Joanna Johnson live in Colorado with their three children, who offer continual inspiration for their stories. Their books include Henry’s Hat, Green Gables Knits, Phoebe’s Birthday, Phoebe’s Sweater, and Freddy’s Blanket. 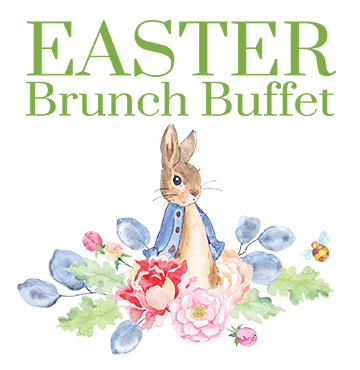 Each book revolves around a charming story and delightful illustrations and includes knitting patterns using Brown Sheep yarns. Brown Sheep and Slate Falls Press share a dedication to using 100% American made materials. The event is free but space is limited. Want to do something good for the climate? Dine at one of Louisville’s downtown restaurants for the first annual Dine out for Earth Day, brought to you by The Empire Lounge and Restaurant, Flatnine Design, Yellowscene Magazine and the Downtown Business Association. 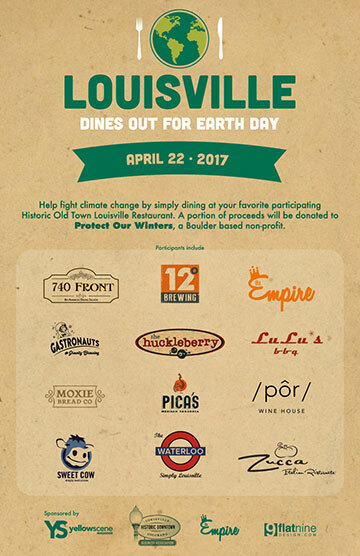 Participating downtown Louisville restaurants will donate a portion of the day’s sales to Protect Our Winters (POW), a Boulder-based, non-profit organization dedicated to mobilizing the outdoor community in the fight against climate change. Participating restaurants include, The Empire, Zucca, Huckleberry, Waterloo, Moxie Bread Company, Pica’s Mexican Taqueria, Gaustronauts, Por Wine House, Sweet Cow, 740 Front and Lulu’s BBQ. Take the family out for a traditional Easter brunch buffet with Italian specialties including Mimosa’s and Italian Bloody Mary’s! Cost is $32 per guest, ($15 per child). Reservations are highly recommended. 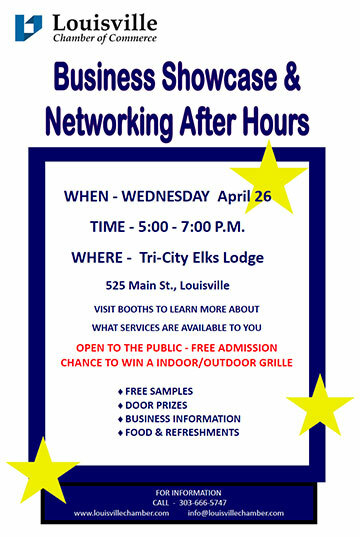 Call 303-666-6199 or visit www.zuccalouisville.com. 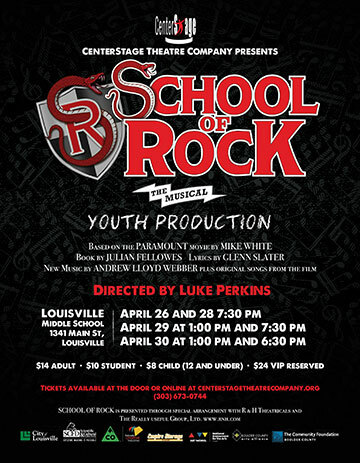 Based on the memorable Paramount film, which starred Jack Black, School of Rock is a brand new musical about the power of rock and roll. CenterStage Theatre Company is thrilled to present the Front Range premiere of this hilarious, heartfelt story – complete with a live band of unbelievably talented young musicians. As part of the First Friday Art Walk series, the Museum will feature Louisville residents who have decades of experience with fly fishing including special guest Tom Mudrock. Tom will show incredibly intricate flies that he taught himself how to make nearly fifty years ago by using such materials as duck and rooster feathers, yarn, embroidery thread, and broom bristles. Advancing your career is a great tactic for improving your overall financial health. This class will cover hot jobs, workforce trends, free resources, paying for professional advice, plus tips for using LinkedIn. We’ll explore options that apply whether you want to stay in your current industry or try something new. Backyard composting is an effective way to reduce household carbon footprints and provide quality compost for use in gardens. Discover how to start and maintain a highly efficient backyard compost system by learning what to feed your compost pile, appropriate bins and methods for our area, tips and troubleshooting, and much more. Space is limited and registration is required at www.bouldercountyrecycles.org or Bethany Hentkowski, bhentkowski@bouldercounty.org. Erie and Louisville share a similar history as small mining communities in Colorado’s northern coal field. There were also some differences, such as Erie having been more directly impacted by the Columbine Mine massacre in 1927. Emeritus Professor James B. Stull will illuminate Erie’s earliest pioneers, houses, mining history, and the town of Erie’s enduring evolution in his presentation based on his 2015 book of the same name.